Georgia Southern University made history on Wednesday, Aug. 20, 2014, when the Board of Regents of the University System of Georgia granted the University with the first undergraduate Manufacturing Engineering degree program in the state of Georgia and Southeast United States. Manufacturing engineers work closely with mechanical, electrical and other engineers as a member of the design team to ensure manufacturability of the product while considering recycling and other aspects of the product life cycle. They also concentrate on the facilities, equipment, processes and methods necessary for the efficient and safe production of products in a globally competitive environment. Manufacturing engineers direct and coordinate the processes for transforming materials into products and guide the design, and conduct analysis and modification of product design to ensure the viability of the design for manufacturability. Currently, there are only 20 accredited manufacturing engineering programs in the U.S and none in the Southeast United States that offer a manufacturing engineering undergraduate program. The Manufacturing Engineering program will be housed in the College of Engineering and Information Technology (CEIT). CEIT prides itself on providing an application-based, practical education using hands-on laboratories and exercises to bridge classroom learning and the “real world.” In addition to the Manufacturing Engineering program, CEIT is working toward establishing a world-class Southeastern Materials & Manufacturing Applied Research Center. The Research Center will enable Georgia Southern’s engineering programs to collaborate with regional corporations to conduct applied research projects, pilot manufacturing studies, product development and technical support. The Manufacturing Engineering program will begin accepting students in fall 2015. 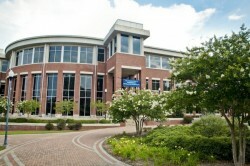 The Allen E. Paulson College of Engineering and Information Technology offers five ABET-accredited programs serving more than 3,000 undergraduate students in its Department’s of Civil Engineering and Construction Management, Computer Science, Electrical Engineering, Information Technology and Mechanical Engineering; and over 100 students in its master’s program. CEIT prides itself on fostering student-centric professional learning experiences by utilizing advanced technologies applied with state-of-the-art equipment, inspiring innovation and invention, and encouraging sustainability. CEIT degree programs are recognized for their intensive hands-on laboratory experiences being an integral extension of the coursework. Visit ceit.georgiasouthern.edu.